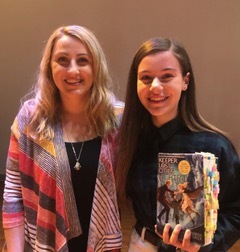 On Thursday, January 24th, we had the honor of a visit from Shannon Messenger, a New York Times and USA Today bestselling author of the award-winning middle grade series, Keeper of the Lost Cities, as well as the Sky Fall series for young adults. So what inspired this visit from such a well known author? It was all because of a 6th grader named Melissa Schwartz was the inspiration. At the beginning of the year, I noticed Melissa had a very large book with hundreds of post it notes attached to the pages. I asked her about the book and why she had marked the pages. She stated that those were her favorite parts of the book. I was so amazed and inspired by her enthusiasm, that I decided I would try to contact Shannon to have her speak at our school. I knew she had just published another book, so getting her to Saint Jeanne would be unlikely since she would be touring. Two months later I received an email that she was available for a visit. The students screamed for joy. Shannon’s presentation went beyond her written words. She inspired our students to be creative thinkers, positive role models, and caring citizens. It was truly an amazing event.